A slight decrease in the danger rating is due to a temporary end in precipitation. However, temperatures are holding steady or even increasing, which keeps the snowpack in an unstable condition. CONSIDERABLE danger ratings can be found at all elevations. The most dangerous areas are below the freezing line - 1000 to 3000 feet - in the zone where we still have a lot of snow but it's been saturated with rain over the last week. This is an unusual (for January) and very dangerous avalanche problem. Large full depth natural avalanches have been seen every day this week. The weather that we need to make the mountains significantly safer will be colder temperatures, which isn't in the cards for today. Traveling on and below steep terrain should be avoided today. The Friends of the CNFAIC and the Rob Hammel family are sponsoring an avalanche education scholarship. Deadline to apply is January 31st. Go to this page for more information. 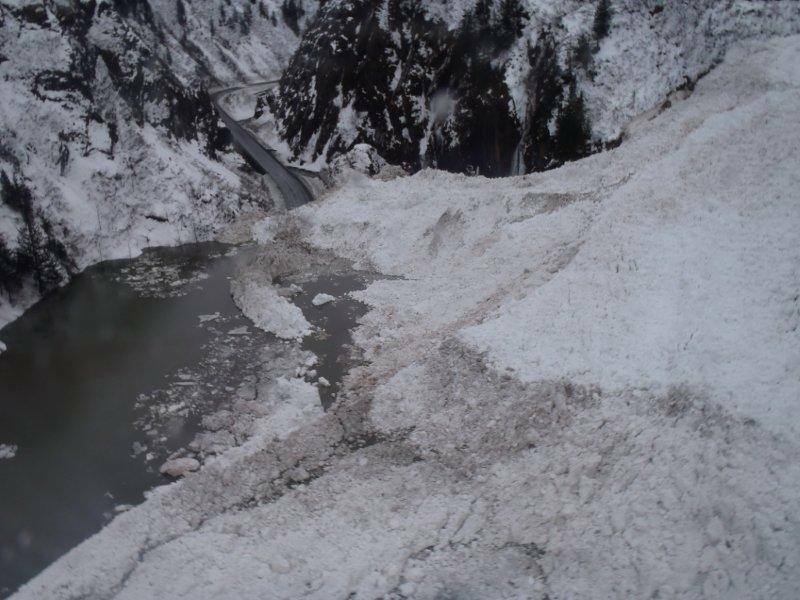 One of the new big avalanches seen at Turnagain Pass was on Pete's North. The Southwest face pulled out full depth sometime Thursday afternoon to Friday morning. As long as we have warm temperatures, this kind of avalanche is possible. It's worth noting that these large destructive avalanches are happening across a huge region in southcentral Alaska. Valdez is currently under seige with the Richardson highway closed (second photo below). Check out this observation for more photos and video from the Summit Lake region. Sun exposure today may have enough power to tip the balance on south facing slopes in the afternoon. Keystone Canyon on the Richardson highway, Friday Jan 24th. From the City of Valdez Facebook page. At the bottom of our snowpack we still have weak snow from November that is making full depth avalanches a reality. This is most obvious from 3000 feet elevation and below where rain-on-snow has created an especially difficult problem. Even higher up, above the rain line, it's been snowing for more than a week. The snowpack at higher elevations is finally getting deep, but stability is in question until we have evidence to suggest it won't slide. Remember, before the storm that dumped many feet of snow on these slopes we had numerous natural and remote human triggered avalanches. Now that the problem is buried deeper it may be harder to trigger but the consequences of resulting avalanches will be significantly worse. The hose of pacific moisture that's been hitting us for the past week has shifted back to the west for the time being. Unseasonably warm temperatures continue today, some of the weather stations are currently at the highest we've seen all month. Freezing level is expected to reach 4400 feet elevation again today. Partly sunny skies are forecasted today. Look for fog in the valleys. Southeast to East wind blowing 42-61 mph at the ridgetops.